Many years ago I worked in an office just down the road from the Massey Ferguson tractor factory in Coventry (England). It was great to see the wonderful tractors setting out all shiny and red for their new adventures around the world. Even the company cars driven by employees were red. The one downside of having that office job in such close proximity to Massey Ferguson came every Friday at noon. The factory hooter would blow and cars would come streaming out of the car park, people would be walking home up the hill or cycling back along Broad Lane into town and I’d be sat watching them with five and a half hours of my working week still to go. On the upside that hooter always reminded me of the “Six o’clock whistle” at the biscuit factory at Chigley, a comforting memory for British people of a certain age. When I saw this “Massey Dacta” I had to have some. It’s named after the tractors, but by the children of the winemakers who quite sensibly loved the old red tractor, but couldn’t say the name properly. It’s the second wine of the Zephyr producers. This particular Massey Tractor had made it half way around the world to Marlborough in New Zealand. I do hope it’s about 25 years old and was one of those that rolled out past me. 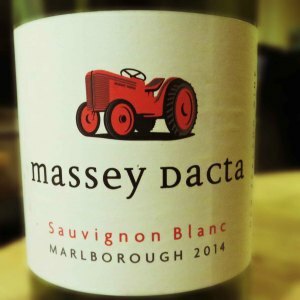 The Massey Dacta Sauvignon Blanc itself is pale green-yellow, and it smells inviting. There’s no hint of engine oil and paint. There’s lots of fresh cut grass and squashed ripe fruit. It’s dry with a bright acidity. It tastes fresh and fruity. The grass is still there, but there’s mango and lime too, with ripe melon in the mix. All that sweet fruit gives it quite a mouth feel. The alcohol level is at the high side of medium, but it’s not obvious. The fresh juicy fruit combined with the green grass really is quite more-ish, and at under £10 a bottle with the current multi-buy deal at Majestic, this is a good buy. Go ahead and click onwards to the Camberwick Green episode where Windy Miller gets drunk. It’s no wonder we were all drinking cider at school.